Искам да ви напомня, че бонуса на Глобет от 100% до 50 евро за нови играчи ви чака. Депозирайте 10 евро и ще получите 10 евро. Депозирайте 50 евро и ще можете да залагате с още 50 евро! Как да ги вземете ли ? Ами регистрирайте се от ТУК, влезте в сметката си и направете първия си депозит между €10 и €60 . За да получите бонуса си, изпратете имейл на customerservices@globetmail.com с номера на сметката си, свържете се с Глобет в чата или се обадете на +44 (0) 20 8246 4801. Бонуса е валиден само за залози на поне 3 събития. Преди да можете да изтеглите бонуса си обратно е необходимо да го превъртите 6 пъти. Валиден е до 28 февруари 2011 вкл. These conditions are additional to the general Terms and Conditions of Globet.com. You will need to rollover your deposit and bonus 6 times prior to making a withdrawal. If the stake rollover requirement for this bonus has not been met within 60 days of the first qualifying deposit any funds held in the bonus balance will be forfeited. Offer closes 23:59 GMT 28th February 2011. Valid for bets placed on Globet Sportsbook only. Not valid for casino or games or poker. If a withdrawal or transfer out is made before the fulfillment of the terms and conditions the bonus is removed from the balance. Existing Globet account holders do not qualify. 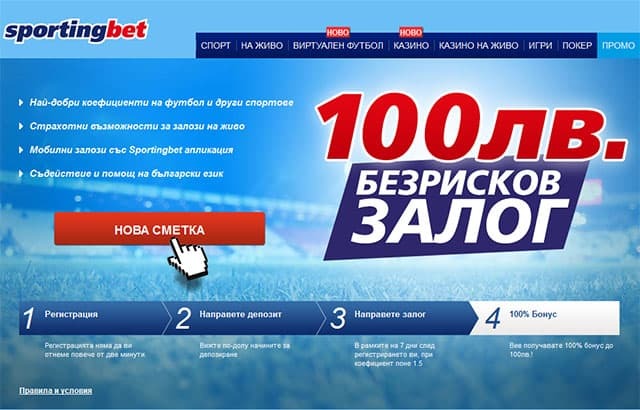 All Globet offers are intended for recreational players and Globet may in its sole discretion limit the eligibility of customers to participate in all or part of any promotion. Before any withdrawals the bonus and deposit amount must be wagered 6 times on different events on Globet Sport with a minimum event selection of three events. Any bet placed containing less than 3 selections will not count towards any rollover requirement. Any Void or Cancelled Bet will not be counted as part of the turnover requirements.Any bet placed or settled containing less than 3 selections will not count towards any rollover requirement. Only settled bets containing 3 events or more will qualify. Globet reserves the right to change these terms and conditions and/or withdraw this promotion at any time without notice. Globet reserves the right to withhold any bonus payment if it is considered any bonus abuse has taken place. Multiple accounts are not allowed. All customer offers are limited to one per person, family, household address, email address, telephone number, and shared computer, e.g. school, public library or workplace. We reserve the right to withdraw the availability of any offer or all offers to any customer or group of customers. Offers only apply to customers who have made a real money deposit with Globet.